Some people who read yesterday’s Devotional were offended by it, and I can understand why. They did not understand how someone like Monica will still have a real relationship with the Lord after what she had done. The truth is, what Monica did when she was an unbeliever was a horrible thing, abortion is actually murder. But she repented and God forgave her. God does not judge people for their past, He judges them based on the way they respond to His word. Now let’s talk about the way people respond to God’s word. I have come to learn that the way to know if someone is truly born again is not by what church he attends or the things he says, even though these are important, they can be faked and there are many morally sound unsaved people. The way people respond to God’s word is the way to know whether or not they are born again. Anyone who has no regard for the word of God has no regard for God and does not really believe in God. Such a person cannot bring forth the fruits of righteousness because the transformation that produces such fruit comes by God’s word. Jesus purges us by His word so that we may be fruitful (see John 15:3). The only way a person can truly walk above sin is by letting God’s word dominate his heart (see Psalm 119:11). 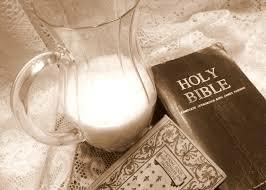 Go into today determining to regard God’s word above your daily bread. Prayer: Thank the Lord for sending His word to transform you into His nature. Ask the Lord to empower you walk in the fullness of His will for your life.